Edwin Dickinson (October 11, 1891–December 1, 1978) was an American painter and draftsman known for his psychologically charged self-portraits and landscapes. His art, always grounded in realism, shows connections to symbolism and surrealism. Dickinson was born and raised in upstate New York, in the Finger Lakes area; his family moved to Buffalo in 1897. The death of his mother from tuberculosis in 1903, the suicide in 1913 of his older brother, Burgess, and his father’s remarriage in 1914 to a much younger woman have all been cited as influences on the themes of his later work. Dickinson had youthful ambitions for a career in the Navy, but he failed the Navy entrance exam twice (though he later served as a radio operator during World War I). In 1911 he enrolled at the Art Students League of New York, where he studied under William Merritt Chase. In the summers of 1912 and 1913 he stayed in Provincetown, Massachusetts, where he took a class taught by Charles W. Hawthorne. 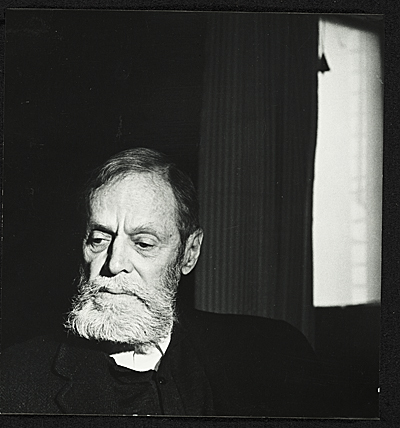 After concluding his formal studies in 1913, Dickinson lived and taught in Provincetown for several years. His mature paintings can be roughly divided into two categories: The first consists of portraits, still lifes and landscapes executed quickly, often at a single sitting (the artist referred to these as premiere coups); the second is comprised of compositions of symbolic and enigmatic character, often large in size and very complex, which sometimes took many years to complete. While his palette tended towards monochrome, his landscapes painted from observation are notable for their strong evocation of light, which is usually hazy but sometimes brilliant. His paintings are often allusively autobiographical in content. His drawings in graphite are notable for their sensitivity to tonal nuance.